Because a ZBrush scene has depth and material properties, virtual lights are required to illuminate the canvas and the objects it contains. The Light Palette provides controls for setting and adjusting these lights. ZBrush calculates shading based on the number, type, strength, and position of the lights in the scene. Lights are added or subtracted from a scene simply by switching them on or off. First click a light icon to select it, then click again to switch on or off; the icon will be colored orange when the light is on. The selected light (which can be on or off) is indicated by an outline around the icon (gray in the default color scheme). Once a light is selected, its properties, such as direction and intensity, can be adjusted. 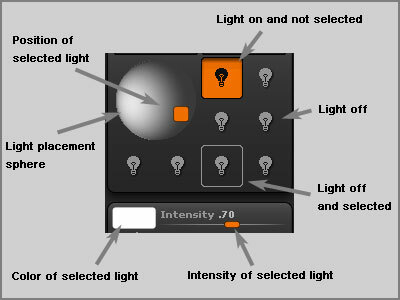 You can place up to eight lights in a scene and change their properties at any time. All lighting properties are saved with the ZBrush scene file. By default, ZBrush has a single light placed in the scene. Lights are selected and positioned using the thumbnail part of the light palette, as shown below. Click on a light to select it, and click again to turn it on or off. Click on the color patch to the left of the Intensity slider to cause the light color to be set to the primary color, or click and drag from the color patch to any other part of the screen to set the light’s color to the color under the mouse cursor when you release the mouse button. The placement sphere in the upper left of the palette shows where the currently selected light is placed, and also shows the combined effect of all lights currently turned on. Drag the small orange rectangle to change the placement of the current light; click it to toggle it from a front light to a backlight, or vice versa. When setting up lights it is important to remember that MatCap materials have their lighting baked in, so the lights in the Light palette will not affect the material. However, you may want to set up some lights for Best or BPR renders so that shadows are cast. Alternatively, you could consider using LightCap.